Google's Solve for X program has determined four moonshot finalists. Learn who they are and the technological advances they represent. The project leverages a breakthrough in science or technology. This year, Google Developer Group: GDG North Jersey is one of twelve worldwide satellite organizations that have been selected to screen applicants for the Solve for X program. As part of this screening, GDG North Jersey has received 72 moonshot proposals and has conducted four preliminary sessions in which a total of 24 innovators presented their ideas to panelists and other attendees. 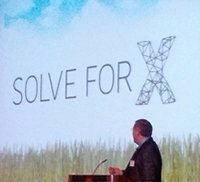 From these four preliminary sessions, Solve for X team members selected four finalists. GDG North Jersey leader Todd Nakamura introduced the finalists at a GDG North Jersey capstone event at Rutgers University on February 2. Each finalist gave a ten-minute presentation on his or her moonshot. Lou Elwell of Bio Soil Enhancers, Inc. spoke about SumaGrow, a replacement for fertilizer that uses microbes instead of chemicals. As far back as the 1880s, scientists have known about Rhizobia bacteria, living inside the root nodules of legumes, and helping to regulate the amount of nitrogen available to the plant. In the last 50 years (and particularly in the last 10) our understanding of the beneficial interactions between plants and microbes has grown considerably. Microbes help plants to acquire nutrients. They also help plants to resist pathogens and natural predators. Certain fungi stimulate root growth and increase a plant's efficiency in absorbing water from soil. Some microbes prevent undesirable absorption of heavy metals, salt and other natural pollutants. During his presentation, Elwell showed pictures of the crops from fields treated with SumaGrow. For example, one picture showed a sweet potato next to a football. (The potato was bigger). SumaGrow costs about $50 a gallon, which treats about one acre. A key takeaway is that none of the microbes in SumaGrow are genetically modified. Wenting Zhang from Stevens Institute of Technology talked about a patient-specific tissue model for multiple myeloma. Multiple myeloma (MM) is a plasma cell cancer that grows in patient's bone marrow. MM is incurable. After chemotherapy, the patient eventually experiences a relapse. But, MM is treatable. If a safe, effective drug can be administered to the patient, the patient's life span can be prolonged. An ideal way to treat this kind of cancer would be to analyze each patient's cells and to create a custom drug for each patient. This has to do with a certain feature of cancers; namely, that cancer starts with a random mutation in a cell -- a mutation that turns the cell into a machine that thrives at other cells' expense. Because of this randomness, each patient's cancer has its own fingerprint. The problem in working with MM cancer cells is that the cells live for only a few days outside of the body, so an individual's MM cells can't effectively be cultured and analyzed. No one knows exactly what these cells need in order to live outside the body. To help solve this problem Zhang's team (Stevens Institute of Technology and Hackensack University Medical Center) extracts many components from the patient's bone marrow -- enough components to recreate an environment in which the MM cells can survive. This new method optimizes an individual patient's therapeutic options, but it's also useful for the testing and development of new cancer fighting drugs. The conventional approach for working with patient's multiple myeloma cells is to inject the cells into mice. But Zhang's technique is cheaper and more scalable. Zhang's technique reproduces each patient's specific tumor microenvironment and doesn't rely on a mouse (whose physiological environment differs from a human's environment). Richard Riman, distinguished professor at Rutgers University and founder of SolidiaTech, presented a way to modernize the world's infrastructure sustainably. About 85% of Portland cement is lime and silica. (Surprise! "Portland cement" isn't brand name.) To create Portland cement, a rotating kiln heats materials to between 2,700 and 3,000 degrees Fahrenheit. This high heat drives off water and carbon dioxide. When this happens, the materials form a rock-like substance (called clinker) that can be ground into a powder. Concrete is a combination of 15% paste and 85% aggregates. The paste is Portland cement and water. The aggregates are sand, gravel and crushed stone. The water hardens the paste through a process called hydration. Hydration is a chemical reaction in which the molecules in the cement bind with the water molecules. The resulting substances are called hydrates, also known as hydration products. The paste binds the aggregates together to form a hard mass. The mass is so hard that the most common concrete can withstand strengths of between 2500 and 6000 pounds per square inch. Once it's produced, concrete becomes stronger over the years. Riman's company uses both carbon dioxide and steam to cure cement. Instead of releasing harmful carbon dioxide into the atmosphere, this alternative to hydration finds a useful application for carbon dioxide. The result is a product that's stronger than conventional Portland cement. Susan MacKay of Cerahelix described a process to unravel the potential of nanofiltration. Today's conventional ceramic filters are created by fusing ceramic particles together. With this approach, manufacturers can create a filter in which the "holes" (the places through which particles can still pass) are about one to two nanometers wide. This brings us to fracking. With fracking, billions of gallons of water are pumped into the ground and cycled out. In fact, the fracking process deals more with water than with gas. But fracking requires water with a very high level of purity. Besides, fracking produces barium sulfate and benzene -- two substances that are dissolved in the water and that aren't filtered when the filter's holes are one to two nanometers wide. Barium sulfate carries absorbed radium, which makes it radioactive. And, if you try to re-use the water, barium sulfate has adverse effects for the fracking drilling equipment. Aromatic compounds like benzene can also cause problems when the water is re-used and benzene is also carcinogenic. MacKay's team proposes a new way to produce ceramic filters. Instead of fusing ceramic materials, the team mixes strands of DNA into an amorphous ceramic material. The DNA takes up space. When heat is applied, the DNA burns away, leaving holes in the material that are between 0.6 and 0.8 nanometers wide. These holes are small enough to filter out barium sulfate, benzene and other contaminants in water. That's a surprising role for DNA molecule. MacKay's group uses DNA for several reasons. First, the team can use any DNA, including less expensive "natural" DNA that's extracted and then purified from blood and other sources. Next, DNA is straight. DNA doesn't coil the way other stranded molecules tend to coil, so DNA forms an optimal passage through which water can pass. Also, DNA forms liquid crystals that help orient the DNA, creating pores that transverse the membrane. At the nanoscale, these features combine to produce benefits that include low fouling, fast flux, high purity separations. Each finalist from the GDG North Jersey program and from the eleven other regional programs will now join Google's Solve for X pioneer program. During the session, a group of about 60 scholars evaluated the presentations, giving the finalists advice for future directions. Clark Lagemann, a team member for GDG North Jersey Solve for X, described the credentials of the scholars on the panel. As a group, the scholars have 21 Ph.D.'s, 61 publications, 43 patents and speak more than 10 languages. Of the GDG North Jersey Solve for X program, team member Sylvia Wandahwa has this to say: "I've had a wonderful time working with Todd Nakamura, Clark Lagemann and Jackie Melillo as part of the planning committee for the Google's Solve for X NJ campaign. Each one of them was a key player in organizing, recruiting and connecting pioneers with the right panelists and scholars. It's been an exciting opportunity to work with the Google X team as well. New Jersey has so much potential and this event really highlighted some of the great work people in this area are doing." On a personal note, I confess that the Solve for X talks have changed my notion of the evolution of big ideas. Until now, my naive view was that each world-changing idea has a life of its own. "Armies cannot stop an idea whose time has come," said Victor Hugo. When I thought about a great innovator, I imagined a clever scientist, sitting alone, thinking hard about a problem, envisioning a solution, announcing that solution and then ... boom! ... the world adopts that solution. Overnight, the scientist becomes rich and famous. That's not how it works these days. And it probably wasn't how it worked in Victor Hugo's time. Each Solve for X pioneer is an entrepreneur -- a person with a big idea, but also with a business plan, a team of co-workers, a newly-founded company, a patent or two, a series of tests that have already been performed, a series of tests yet to be performed and some (but not yet enough) funding. Each pioneer's work is still in its infancy. The pioneers come to Solve for X with a need to show their work to the world -- to get feedback from the scholars at the Solve for X session and to get one more name (Google) on their list of endorsers. Each pioneer has walked a long road so far, and has a very long road ahead. This is how big ideas move forward to become world-changing ideas. It is a difficult world to get ideas off the ground. This is a great way to raise awareness and support some great new innovations.